by Justin Bertolero Michael Haneke’s 1997 horror-thriller, Funny Games, focuses its lens on the spectatorship of violence and its role in our culture, all the while sadistically throwing it back into the viewer’s face with a tongue-in-cheek attitude. After viewing the film, one may find themselves wondering just how much violence has saturated our movies and TV shows, becoming something that has seeped into the very roots of our culture. Funny Games follows the cold blooded antics of Peter (Frank Giering) and Paul (Arno Frisch), as they terrorize a family staying at their lakeside vacation home. Sporting pristine white gloves and fake smiles, the duo arrives at the door, introducing themselves and asking to borrow some eggs. Although seemingly friendly and welcoming, they immediately casts an unsettling feeling on the family. Claiming to be friends of the neighbors, the boys’ attempts at politeness are easily seen as thinly-veiled disdain. When finally asked to leave, the night devolves into nightmaric chaos as the family is taken prisoner and subjected to the boys’ ruthless “games,” all of which involve forms of physical and mental torture. The themes of the film are immediately set up by the simple juxtaposition between good and evil. It opens on the sitcom-esque family driving to their vacation home on a beautiful summer day. The car stereo is playing pleasant opera music, which is immediately interrupted by a brutal thrash metal song, not so subtly showing the contrast between dark and light that the rest of the film would eventually portray. Due to its subject matter and gritty direction, Funny Games is seemingly drenched with influence from low budget 70’s slasher flicks like The Last House on The Left and I Spit on Your Grave. These classics, much like Funny Games, took an introspective look at violence, and shoved it down the audience’s throats to get the point across. Michael Haneke, the director of critically lauded films such as Caché and The Piano Teacher, is no stranger to experimental and penetrative filmmaking. Haneke attempts to mix actual fear and tension with several winks and nods at the camera. In one pivotal scene, a character literally looks into the camera and rewinds the turn of events, eventually leading to a much more grim outcome. In this way, Haneke toys with the emotion attached to violence even more, giving hope to the audience before playfully taking it away. In the film’s production notes, Haneke is quoted as saying: “The problem is not ‘How do I show violence?’ but ‘How do I show the viewer his own position in relation to violence and its portrayal?’” He goes on to talk about how the “domestication” of violence through film has left viewers desensitized to depictions of gore and brutality in everyday life. This attitude is represented by the film’s over the top suggestions of violence and torture. The first killing occurs out of sight as Paul fixes himself a sandwich downstairs in the kitchen. And later, while the mother is forced to strip, the camera is focused on her face for the entirety of the scene. Much like the “games” played by the boys in the film, Haneke parallels the characters by playing games of his own with the audience. By not showing the bulk of the violence on screen, this form of teasing the viewers hits the root of what truly makes violence effective: often times the actual visual representation of torture and cruelty pales in comparison to the agony and fear that surrounds it. Both the film’s theme and its execution are thought provoking and interesting to say the least, but when focusing on the story and the film as an entire package, the viewer is left with a sense of repetition and excess. 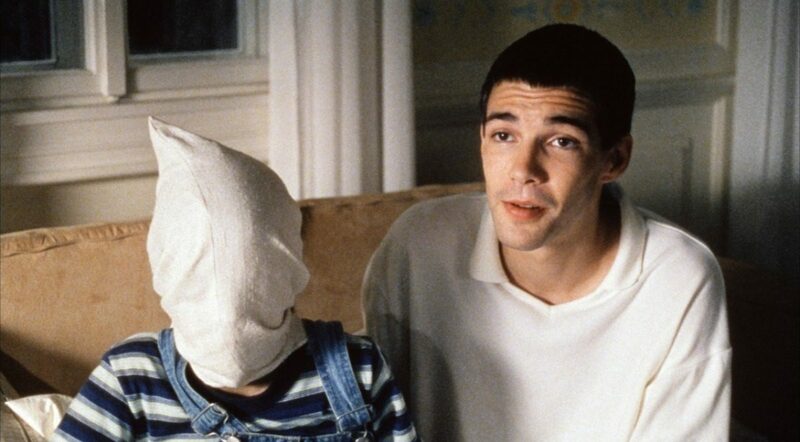 Funny Games relies on the tired old home invasion premise, which itself lacks any originality. As is often a complaint with many Haneke films, the concept in some ways consumes the movie, leaving no room for character development or a satisfying story arc. This lack of narrative strength is exemplified even further in the aforementioned “rewind” scene. While this choice is original and courageous, it really takes away from the importance of the character’s actions when the antagonist holds this god like power and nothing really matters. Meanwhile, the relentless severity of the antagonists, combined with a one note plot may not satisfy every viewer (even though the film’s disturbing aspects serve a clear purpose). Despite these flaws, Haneke yet again takes an insightful look into film violence in a way few directors have before. After leaving the theater one might feel more like they just endured a social experiment rather than watched a movie, which is something that sets this film apart from other generic home invasion films. Tags: Justin Bertolero. Bookmark the permalink.